When I heard last week that the Trump administration had released a budget plan that would eliminate funding for the Community Development Block Grant program, which provides partial funding for local Meals on Wheels groups, I wanted to shake someone. For over 12 years I was lucky enough to volunteer for Meals on Wheels and often grew close to my “clients.” I saw how hard their lives were and how determined they were to survive. What will happen to people like them if the loss of funding ends or curtails the work of Meals on Wheels? Over the next week or two I’d like to share a few posts I wrote years ago about the people I got to know and love through Meals on Wheels. I think you’ll love them too. I’m so grateful for their friendships and all they taught me. I was doing my Meals on Wheels route last week when I noticed a name missing from my delivery list. Where was Mr. Williams? I’d missed seeing Barry the last time around, but I’d assumed he was at a doctor’s appointment, as my clients often are. I drove by his house anyway, just to see if a home health nurse was visiting. Maybe a neighbor would be standing out in the yard and could tell me if he’d been moved temporarily to a nursing home. It happened before with Mr. Foster and Miss Pearl. Miss Pearl still lives there and loves her new life. Being such a chatty lady, she talks the nurses’ ears off. What I saw in front of Mr. Williams’ tiny house sent shivers up my spine. 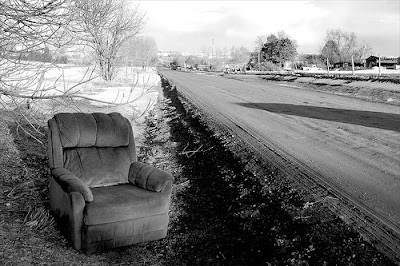 There, out beside the garbage by the side of the road, was his recliner, the chair in which he spent his life. He slept in it at night so he could stay upright, and sat in it all day long, watching television or looking out the window. It was the only piece of furniture in his living room–the only piece of furniture in his small house besides his bed, a dresser, an old dinette set in his kitchen, and whatever was in his granddaughter’s room. She lived with him, though he once told me that she was only there half the time. The other half she was on drugs, wandering the streets. He worried about her, and when she’d take his television and move it into her room, he put up with it. “Would you like for me to go in there and get it, so you’ll have something to do?” I’d ask. I got on the internet and searched for an obituary in the local paper. There wasn’t one. Of course there wasn’t one. Who would have sent it in anyway? He had no family left in the area except his granddaughter. There wasn’t any record of a funeral or where he was buried. What happens to people like Mr. Williams when they die? Where are they buried? I’m asking because I really don’t know. I wish I’d known Barry Williams even better. I can tell you that he was a very kind man. Every single time I came, he told me how much he appreciated his meal. He was diabetic and had serious problems with his legs and feet. He’d leave the door unlocked each morning so that he wouldn’t have to get up and answer it when the Meals on Wheels folks knocked. He’d just shout, “Come in,” and I’d let myself in. He’d always ask me how I was, and then he’d pull off his blanket and show me his legs. I’d try not to wince. They were always blueish red, covered with sores. He’d lost a couple toes to his diabetes, but he never talked about it. Last year I was lucky enough to be the one who delivered his birthday meal. Meals on Wheels is great about giving clients cards and donated cakes on their birthdays. “You’re going to have to read it to me,” he said when I handed him the card. “Do you want me to get your glasses?” I asked. When he muttered that he couldn’t read, I tried not to look shocked. I’d never known that about him. Months later I noticed that the birthday card was taped to his refrigerator, in the envelope with his name on it. You would have liked him.